The Holt Accelerator — Halfway Point Highlights! The Holt Accelerator officially kicked over just a little 6 weeks ago — and what a first half it’s been! 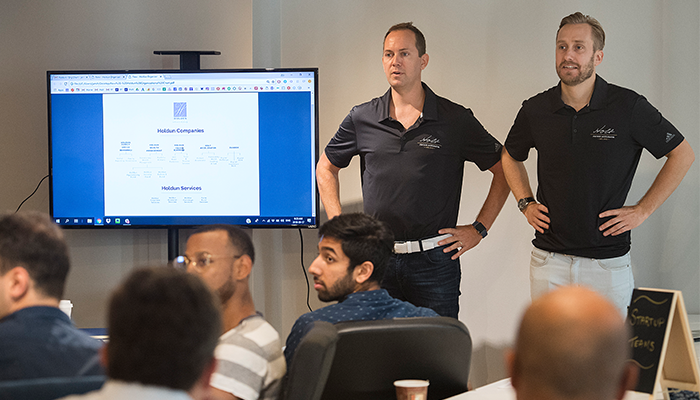 September 17th marked the start of the 12 week program, where we welcomed our 13 finalists to Holt HQ in Montreal, for the start of what promised to be an incredible couple of weeks as we embarked on this exciting opportunity together. From workshops, to 1:1 mentoring, to training sessions to networking events and so much more, the first 6 weeks of the accelerator program has been an action packed experience — and it’s not showing any signs of slowing down! “The first weeks of the Accelerator have been a truly unique experience for everyone involved. We have the magic word ‘momentum’ on our side — the inbound traffic of world-class advisors and financial institutions that are reaching out to us to get involved is a testament to the success we’ve had so far. “In terms of the teams achievements, within 6 weeks of the program we’re already seeing teams getting term sheets from connections we have made, as well as senior bankers with 20+ years of experience leaving their current positions to join our startup teams. Check out what some of the teams have accomplished in the first half of the program — they’re moving fast! Commercial Passport were also featured on the CEO Money show — take a listen here! It’s been a busy time for Consilium Crypto — in the first 6 weeks of the program, they have signed a partnership agreement with one of the largest blockchain consulting firms in the world! Consilium Crypto have also been featured on the CEO Money show — check it out here! CreditScript took part in the ADGM Summit in September, as well as joining Google for Startups! They have also hired a new Head of Data to join their London team. In addition, the team were selected to pitch at last week’s Fintech Forum event in Montreal, from over 118 applicants! Curu have began networking with Canadian-based Banks, as well as finding synergies and high-value partnership opportunities with 2 cohort companies. With the help of the Holt mentors and advisors, Curu has also created a new sales B2B2C pipeline and given their data room, financials and legal structure for due diligence a makeover! Lead by CEO Christina Camacho, Ivy Lender has established some great connections and are in discussion with multiple investors as a result of introductions made through the program. They have also been fully immersed into the Canadian FinTech ecosystem with the help of the Holt Accelerator network. The most exciting milestone from the past 6 weeks? They are working towards partnering with a fellow team in the cohort on a project to enhance their platform and offer new solutions to their clients with blemished credit scores. In between workshops mentoring at Holt, the Kapital Wise team have been busy working on their new look and branding, launching their new website this month! In the past month, LMX have appeared on 2 podcasts — Fintech Impact with Jason Pereira and CEO Money, to showcase their platform. They have also been busy conducting meetings with potential investors and have secured some client meetings with Top 20 Global banks and Fortune 250 Companies, thanks to connections made through the Holt Accelerator network. So far, Holt has been key in helping LoanConnect better set and achieve operational objectives. Growth from startup to an in-revenue / scaling company can be fraught with challenges. The team from Owl were last week crowned winners of the Pre-Series A pitch battle at the annual Canadian Fintech Forum, held here in Montreal! This is a huge achievement for the team, and a testament to their disruptive innovation making waves in the fintech space. With coaching guidance from Holt Managing Partner Jan Arp, Sean took the stage by storm and walked away with $25k in prize money! This is the third consecutive year that Jan has coached a team to success at Fintech Forum. During the first half of the Holt Accelerator, the team at PrestaGente have been working towards the implementation of the 2.0 version of their platform. With Holt’s network and mentorship, they have also secured potential leads in the North American market and are excited for the further progression of the accelerator! The team at QuantumSense had the fantastic opportunity of pitching to over 200 industry leaders at the recent Insurtech North event, held in Gatineau, Quebec. They have also been featured on Innovators Edge podcast, showcasing their achievements, and are expanding their team with the hiring of a new sales associate!